January 2, 2014 Officials of the Islamic Union of Kurdistan (Yakgirtu) distanced themselves from the Muslim Brotherhood organization, soon after it was listed as a terrorist organization by the Egyptian government last week. Following the ouster last summer of president Mohammed Morsi by the Egyptian military, his Muslim Brotherhood organization has also been banned and many of its members subsequently jailed. On December 26, the Egyptian government listed the Muslim Brotherhood as a terrorist organization. As he rejected claims that his party was linked to the Muslim Brotherhood, Rauf condemned Egypt’s act of branding it as a terrorist organization. ‘If the Muslim Brotherhood is a terrorist organization then it means there are no moderate Muslims in the world,’ said Rauf, referring to the ‘moderate politics’ of his group. The Kurdistan Islamic union, founded in 1994, is locally seen as a branch of — or a party with close links to — the Egyptian Muslim Brotherhood. Other members of the Islamic union have previously stated that they are inspired by some of the ideas of the Muslim Brotherhood. The GMBDW reported last week on the Egyptian designation of the Muslim Brotherhood. Our predecessor publication reported in 2009 that the Egyptian Muslim Brotherhood had identified the Kurdistan Islamic Union as a branch of the Muslim Brotherhood in Kurdistan. The KIU’s influence holds steadily low due to the relatively low level of support for the Islamist agenda in Iraqi Kurdistan. The overwhelming number of Iraqi Kurds have consistently proven to be dedicated nationalists (to their desired independent Kurdish state). 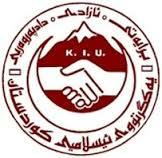 The Kurdistan Islamic Union (KIU).